Yàn celebrates Singapore’s National Day this year with a range of bite-sized specials added to their lunch dim sum menu for the month of August. 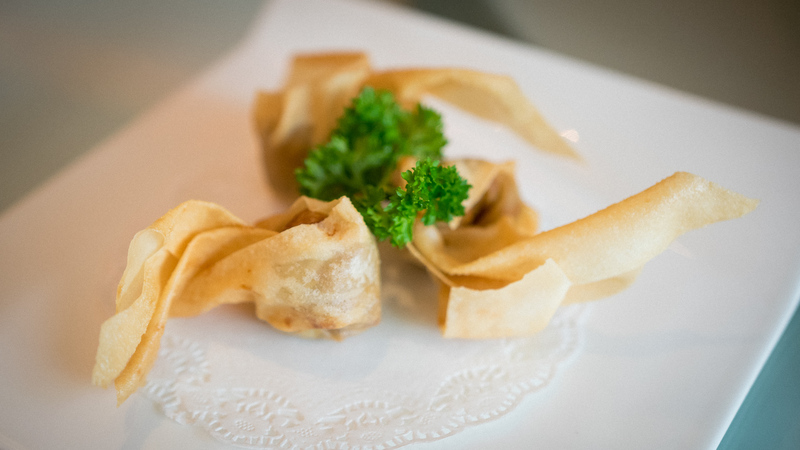 Taking inspiration from favourite local dishes, the specials are neatly presented in dim sum form. The Pan-fried Singapore Chilii Crab Meat Bun ($9.00++ for 3pcs) is an interpretation of the popular chilli crab dish with man tou (buns) usually served on the side. This time around, the sauce is inside the bun. A great way to enjoy the local favourite without all the dipping and messing about. 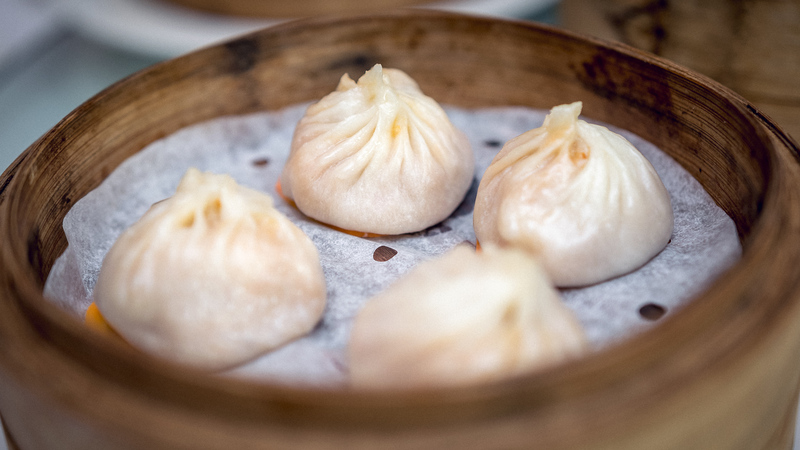 The fried buns are springy and fragrant from the sesame seeds, although we thought the dough layer could be thinner and the amount of crab meat inside increased for a little more flavour and texture. The crab meat sauce is on the sweeter side and not too spicy. This makes a fun bite for the whole family. Laksa is another local favourite, and at Yàn for National Day, it comes presented in the form of dumplings. These Steamed Laksa Xiao Long Bao with Diced Shrimp ($5.80++ for 4pcs) should be eaten when they reach the table so that you get to experience the warm soup filling while the ‘skin’ of the dumplings are still soft. The Laksa broth is more mild in flavour than your usual Laksa dishes, but tasty nonetheless. One crisp dish which I enjoyed was this Deep-fried Satay Chicken Wanton ($6.80 for 3pcs). Once you bite into the crisp parcels, the aroma of peanuts is evident then the oozy satay sauce hits your tastebuds. The chicken that’s wrapped in the wanton is marinated with curry powder, tumeric powder and satay marinade overnight. Definitely a new way to experience satay flavours. The Steamed Pork and Mushroom Dumpling with Chives ($6.80++ for 3pcs) is a take on the local Soon Kueh. 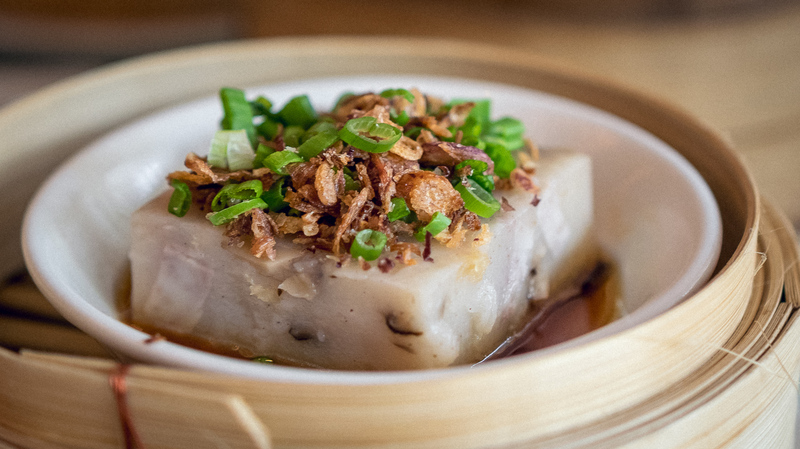 Filled with turnip, chives, mushroom and minced pork in a supple crystal skin, the turnips provide a delicious crunch with every bite. One of my favourites from the National Day menu is the Steamed Yam Cake with Mushroom and Dried Shrimp ($5.80 per piece). A simple local delicacy of thick-cut slices of steamed yam. It’s topped with lots of fragrant fried shallots and spring onions and served with a savoury sauce. The perfect comfort dish for me. The last, and definitely not least, is this Steamed Hainanese Chicken with Sticky Rice wrapped in Lotus Leaf. For something delicious and definitely filling, it’s just $4.00++. Served with the usual chicken rice sauces (chilli, ginger and dark soy sauce), unwrap the lotus leaf to reveal fragrant chicken flavoured glutinous rice. Break apart the rice to access the tender chicken thigh meat slices. I’d recommend having the rice and chicken with the house-made chilli sauce with a kick. I would gladly go back to enjoy this dish. The featured National Day dishes are available at Yàn till 31st August ’18 during lunch hours (12:00pm–2:30pm).